The sunny weather of last week made the dandelions in my side yard all change from yellow bursts of color to clusters of seed fluff. Then late Saturday evening, the rains came back and beat the fluff to smithereens. This particular flower head only housed one remaining seed. Nice macro I tried shooting a similar photo last week but failed. So beautiful ... and looks so fragile. Even the so called "weeds" are beautiful. Great macro. So airy, - lovely photo. My 10 y.o. daughter LOVES these. Wonderful!!! 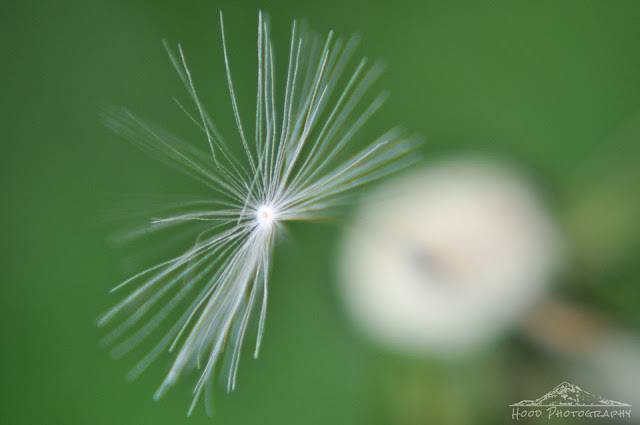 Such a great photo of the little, flying dandelion seed!! !